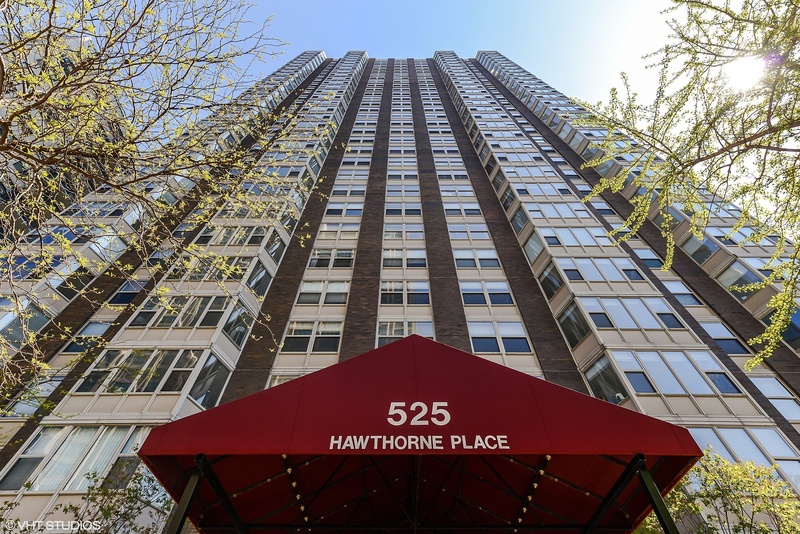 Showstopping 180 degree views of city skyline and lake from south facing windows in every room of this spacious, well maintained high-flr unit on historic Hawthorne Ave. Largest 2 bed/2 bath flr plan with tons of closet storage, plus storage locker on same floor. Hdwd floors in foyer, living/dining, carpet in bedrms. Kitchen features granite counters, all newer (2017) s/s appliances. Generous master with ensuite bath and multiple closets; 2nd bedrm fitted with built-in ofc, plus queen Murphy Bed. Indoor pkng included in price!! Bldg amenities include 24-hr doorman, receiving rm, on-site management & engineer, outdoor pool, giant sun deck w/gazebos & grills, fitness rm, large laundry rm, and more! Walk to restaurants, entertainment, groceries and shopping. CTA Bus #151, #135 & #146 just 150 ft. away. Nettlehorst school! The perfect East Lakeview location! Heat, A/C, basic cable/ internet, pkng included in mo. assessmt. See Agent Remarks.